Fax Voip Windows Fax Service Provider enables Microsoft Fax and Windows Fax and Scan, which are built into Windows, to send and receive T.38 and Audio Faxes using VoIP. ECM (Error Correction Mode) support. Multiple SIP Registrations. Call Routing. Fax Voip Windows Fax Service Provider (Fax Voip FSP) enables Microsoft Fax and Windows Fax and Scan, which are built right into Windows, to send and receive T.38 and audio (over G.711 codec) faxes using your VoIP (SIP or H.323) infrastructure without any further cost. Windows Fax Service and Windows Fax and Scan application is an integrated fax software included in all Windows versions. It is an extensible fax platform that you can use to deploy shared fax resources in your organization. Users within an organization can install a connection to a remote fax printer on a network fax server and send and receive faxes using shared fax devices located on the server, as well as from a local fax device attached to their computers. Fax administrators can configure, manage, and monitor these shared fax resources. Centralized management of server-based shared fax devices means easier management and maintenance, and lower costs. Fax users can send and receive faxes without the need to use manual fax machines, saving time and effort. Fax Voip FSP replaces the standard Microsoft Modem Device Provider by the Fax Voip T.38/G.711FAX Device Provider. This allows you to use the Windows Fax Service most efficiently. In particular, the ECM (Error Correction Mode) is supported. The busy signal is also detected correct way. Using Fax Service Provider (FSP) instead of Virtual COM Ports and modems significantly improves reliability of your fax system. 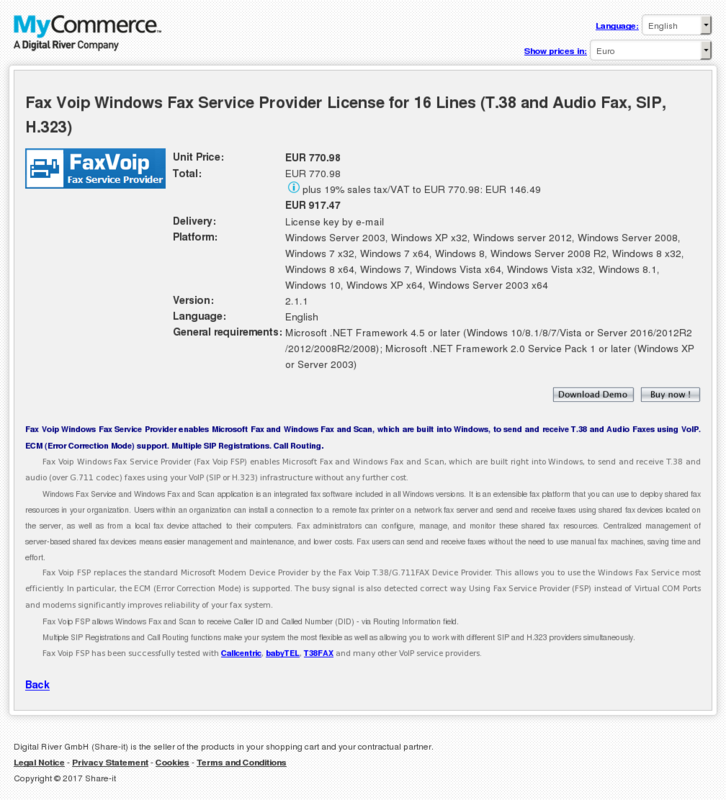 Fax Voip FSP allows Windows Fax and Scan to receive Caller ID and Called Number (DID) – via Routing Information field. Multiple SIP Registrations and Call Routing functions make your system the most flexible as well as allowing you to work with different SIP and H.323 providers simultaneously. Fax Voip FSP has been successfully tested with Callcentric, babyTEL, T38FAX and many other VoIP service providers.